Tell me if this rings a bell. You start listening to something while doing something mindless, like folding laundry or something. When you're done with that task, you might move to something less mindless and...BAM! You're now a chapter and a half further in and don't know if you're still listening to Catelyn Stark wax on about how she misses her boys or Daenarys Targarian discussing how she misses her Khal. If you're an audiobook reader, you know how convenient it can be to stay well read even if your routine doesn't allow you to curl up with a good book often enough. Audible, a leading audiobook service, makes it easy to prevent yourself from getting your plot lines in a twist as long as you creatively use it's features. 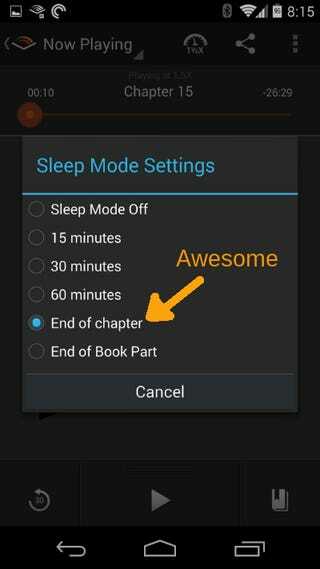 Use Audible's Sleep mode "End of Chapter" to limit damage if you get distracted by life. Chapters are usually small and linear enough to skip through to go back and find your place relatively easily if you get sidetracked. If you use the "15 minutes" or other timed options, you might be jumping between different plot areas that the author is bouncing between. When you're reading a physical book, you probably don't put it down mid chapter. Why do the same for an audiobook? It just makes sense if you're about to move on to do something else, you might want to 'finish the thought' by stopping where the author says is a good place to stop. This makes for an easier transition both away from the book and when you pick it back up again. Some books do more than just take a pause in the action but switch characters or topics. If you are spaced out for a paragraph in the middle of a character's soliloquy, you might miss some useful info; but if you space out during a chapter intro paragraph, you might not know who is talking or what the hell is going on at all. The effect of that will be that you'll get confused, you won't be as engaged, and you won't get as much out of your book. If you use the sleep function to automatically pause at the end of a chapter, you'll be more likely to understand what happened in the last chapter as well as get mentally ready to move to a new area of the world the author is creating. Obviously, this little tip is a personal preference that might have a better solution. How do have a better way? Share below.